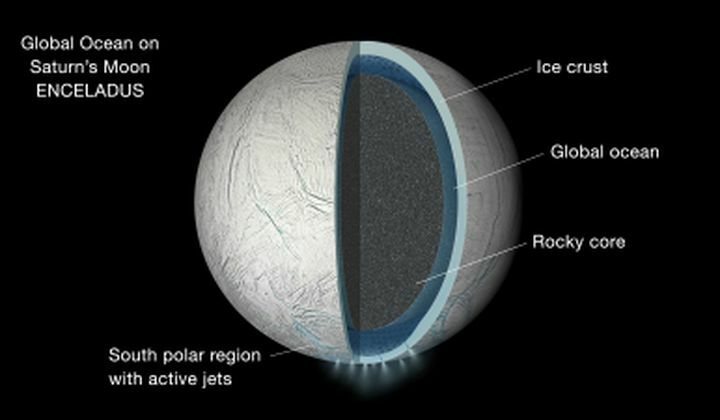 Hidden underneath an icy crust is an ocean surrounding Saturn’s moon Enceladus. Scientists already knew that the moon exhibited a wobble that meant there was water underneath the surface, but it took a team studying seven years of images from NASA’s Cassini spacecraft to precisely calculate how much liquid. If there was only a partial sea, meaning the rocky core and crust of the moon were rigidly connected in parts, the wobble, called a libration, would be far smaller. Instead, the wobble showed that there must be a global ocean completely separating the core and crust (see image). Cassini will flyby Enceladus again on October 28, where it will make its deepest dive—passing just 30 miles above the surface—through the moon’s icy plumes at the south pole.